“Our CPI is WHAT?” I said. 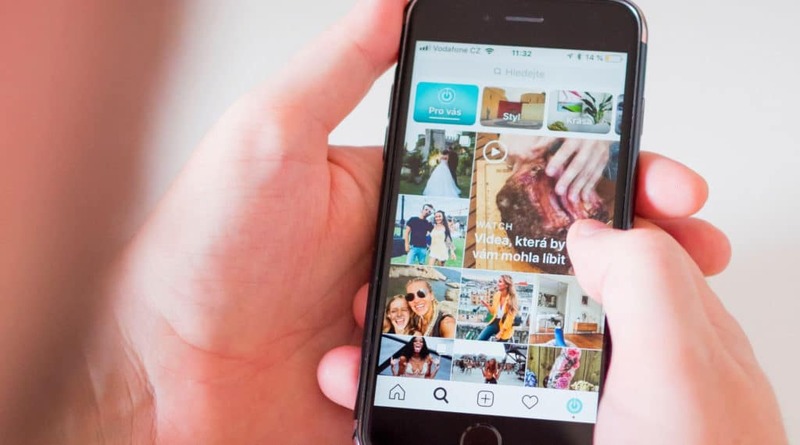 We had just run our first influencer marketing campaign – and the CPIs I was seeing for these influencers were in the double digits, many times that of other sources for our app. I was shocked – and embarrassed. Nearly all the influencers we had used had shown a similar performance. I had been very excited about testing influencers – because, wasn’t that what all the cool kids were doing & being successful with? “Sure,” I said. Yep, that’s how Youtube worked. That wouldn’t make our numbers look any better though. So I decided not to run any more influencer marketing campaigns for the product at the time. It was only later, when I learnt to run influencer campaigns the right way did I realize that we’d measured the performance all wrong in my first attempt(in all fairness, I had no idea). 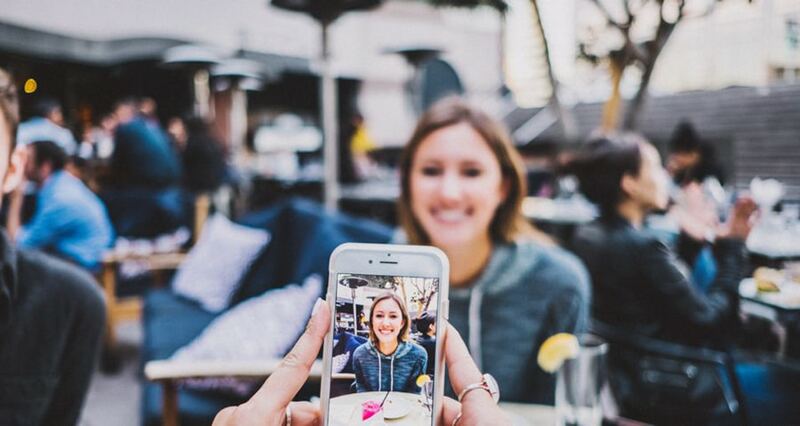 The big challenge with influencer campaigns is that they aren’t your directly attributable campaigns that you’d have from your other sources. Some of your users coming from influencer campaigns click on links, sure – but most of them will watch the video, and search for your app separately, and then install, thus showing up as ‘organic’. 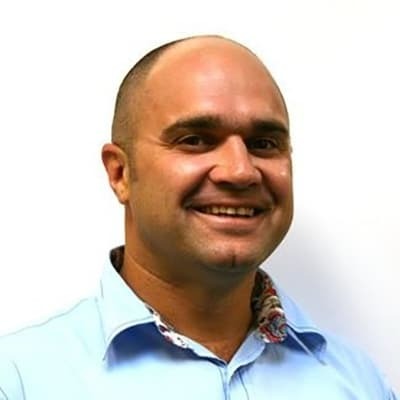 After my first attempt, I learnt that just because these campaigns aren’t directly attributable, that didn’t mean we could do nothing about it. I learnt that we could absolutely make intelligent assumptions to arrive at a very good estimate of influencers’ performance. Here is the approach I learnt and put to use, and you can use too. Each influencer will have ‘directly attributed’ installs(ie – installs that are attributable directly to them via an attribution link) – in addition to organic installs that resulted from the influencer(ie – users who viewed the influencer’s creative and installed without clicking on the link). While these ‘organic’ installs cant be directly tracked, it absolutely is possible to get a very good estimate of these numbers. Export hourly data from your MMP to identify a baseline organic number for your ‘measurement window’, a time frame when you expect most installs to come from an influencer after they go live. 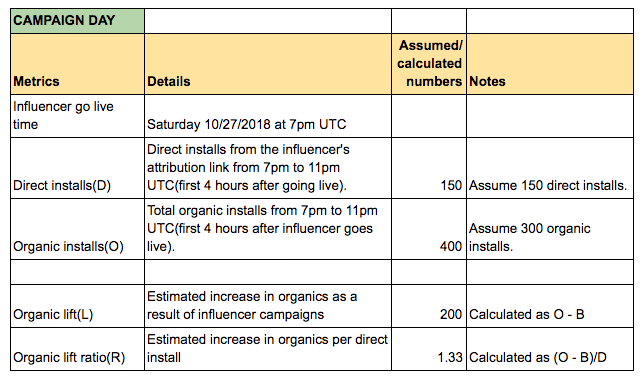 A baseline number is the number above which your organics go once the influencer goes live.I typically recommend a 4 hour time frame as a measurement window because that is when most direct installs from influencers come before the organic lift from them starts to subside into noise. For instance, if the influencer is going live at 4pm, identify baseline organic numbers from 4pm to 8pm for the same day of the week for at least the last 4 weeks). That said, if a different measurement window makes more sense for your biz – 2 hours or 6 hours or 1 day, you should feel free to use that. Report directly attributed installs for each influencer after whatever tracking window you’re measuring(we typically take 14 days). Calculate your total attributable installs = (1 + R) * Directly attributed installs. Here is an example of how this calculation would work in practice. You can also refer to this handy spreadsheet which you can make a copy of and customize as needed. Our organic baseline calculation period is from 7pm UTC to 11pm UTC. Your organic baseline (B) = Average of the sum of organics from 7pm UTC to 11pm UTC for the 4 preceding Saturdays. Let’s say this is 200 installs. It’s Saturday 10/27 at 7pm UTC. Influencer A goes live. Direct installs attributed to the link used by influencer A(call this ‘D’). Say this is 150 installs. Total organic installs your app got during this 4 hour window(‘O’). Say this is 400 installs. 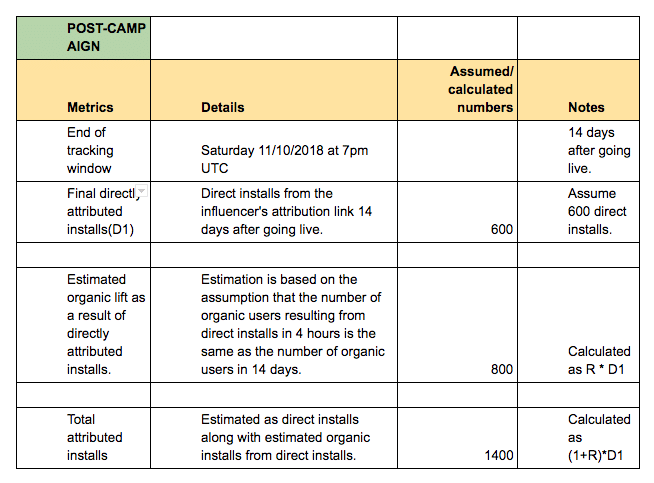 – Your organic lift(L) is calculated as ‘total organic installs in the first 4 hours’ – ‘organic baseline’(O – B above). This would be (400 – 200) above = 200 installs. Your campaign ends after your tracking window(typically 14 days after the influencer goes live) – so this would be on 11/10/2018. On 11/10/2018, you track your final directly attributed installs. Call this D1, let this be say 600 installs. That gives you about as accurate a measure of the actual performance of your campaigns as possible given the uncertain & only partially quantifiable nature of influencer marketing. And learning that process of course explained to me what I had missed when I had done it wrong. I had taken direct installs after the first day(rather than 14 days), and assumed no organic lift and used it to calculate CPIs. In the above case, we might have had say 300 directly attributed installs after the first day, so we’d calculate a CPI of $4+ rather than the actual CPI of $1. I messed up back then, but learnt from it. Thankfully. I hope your learning process isnt as hard as mine – and that you’re able to use the above methodology and spreadsheet to estimate influencer performance accurately. [With much thanks to Adam Hadi for showing me many of the nuances of influencer marketing]. 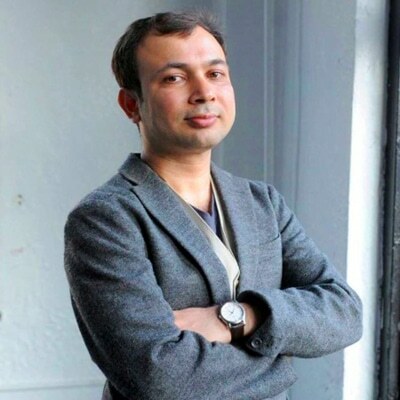 Shamanth Rao is the founder and CEO of RocketShipHQ, a boutique growth marketing firm specializing in performance marketing driven by high velocity video ad production. 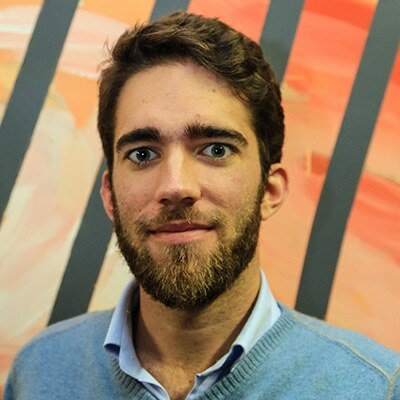 Previously Shamanth led growth efforts leading to two acquisitions – Bash Gaming (acquired for $170 million) and PuzzleSocial (acquired by Zynga). RocketShip HQ is offering free, no-obligations consultations on mobile growth strategy for readers of the App Growth Experts blog. To request a consultation, please fill in the form here. "App Growth Summit had a great balance of non-gaming and gaming insights, and is the perfect networking environment for real experts coming from all over."